What you’ll see depends on which platform and browser combination you are using. Anybody using a PC or Mac running an out-of-the-box install of Firefox or a PC running Internet Explorer will be seeing two identical pictures. If you are using Safari on the PC or Mac, Internet Explorer on the Mac, or you’ve made certain changes to the configuration of Firefox 3, you’ll be able to see a difference between the two images. The difference is down to colour management. The two images were posted to Flickr by user jamieourada, who had always put the fact that his pictures appeared badly on PC’s down to lousy or mis-configured monitors on the PC’s that were viewing the pictures, but had just discovered a relatively unknown fact, which is that Safari honours the colour profile embedded in an image. Essentially colour management is about ensuring that colours appear the same across multiple devices, so for example the colours that your digital camera records are the same colours that are displayed on screen when you are working with the picture, and that are printed out when you print your picture on a printer. This is dealt with by embedding a colour profile into the image file. Tools like Photoshop can work with, and even change these colour profiles for a particular image, which is what has happened here. The problem is that most web browsers totally ignore the colour profile that has been embedded in an image, and instead apply a generic profile, so whilst this doesn’t much matter in an average web site, when you’re looking at photographic images it becomes a noticeable problem. If you look at the second image here, which is the one that is using a colour profile the colours look a lot more vibrant than they do in the version without a profile – but only if you’re using Safari, or have enabled colour management in Firefox 3. Of course a lot of the time the differences can be quite subtle, but the differences in this image, particularly the areas of rust, are really quite striking, really highlighting the issues. So, if you’re serious about wanting to see pictures online as was originally intended, you owe it to yourself to grab a copy of Safari, or enable the colour management settings on Firefox 3.
test 1 with profile and test 2 no profile originally uploaded by jamieourada. Hat tip to regularjen for twittering the picture. Having said that, she is actually quite a good test as with the multitude of different colours in her coat it usually shows up pretty quickly any issues. 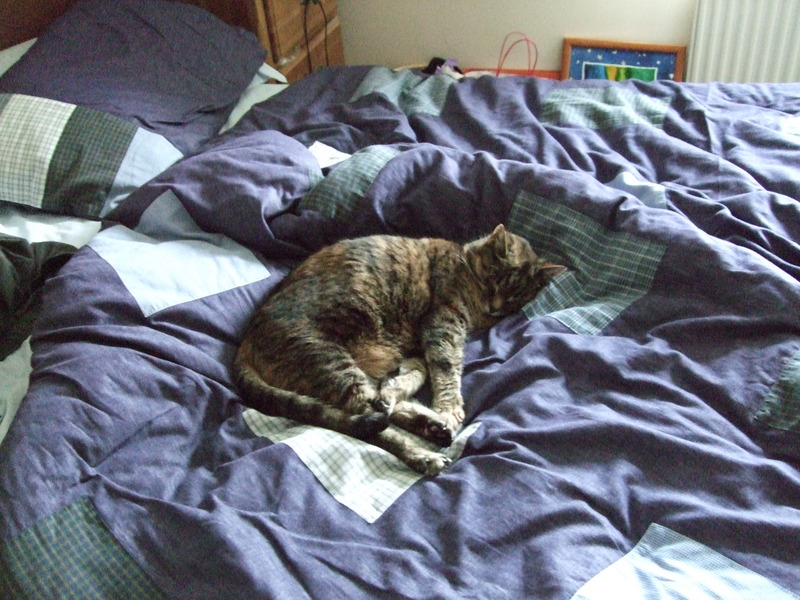 This time the picture is of Sophie asleep on our bed, taken using the natural light mode of the camera, and with very little of that. Although the image stabiliser is on, the other thing the camera has done is bumped the ISO setting up to 1600, which pretty well immediately shows up one of the issues with the camera, and one of the main criticisms I’ve seen of it – the noise you get in high ISO images. It doesn’t look too bad at the size on this page, but if you take a look at the original size you can clearly see how noisy the image actually is. It is something that can be cleaned up with a bit of work in Photoshop, especially with specialist plug-ins like Neat Image, and also being aware of it you can configure the camera accordingly – it’s just going to be snapshots like this one where it comes up. As with any camera, it’s all a question of getting used to it’s particular peculiarities, strengths and weaknesses. At times it seems that almost every day there is some new fantastic picture that comes in by e-mail. Of course many of them are clever Photoshop fakes, but a surprising number are not. Take these two fun quizes and see if you can spot the computer generated fakes from the real pictures. First, the Urban Legends site has a quiz containing many of the famous e-mailed pictures. Secondly, software company Alias asks you to work out which pictures are generated by computer. I got 74% in the Urban Legends quiz, but only managed 5 out of 10 in the second.